QUARTER-FINAL PREVIEW: The ruling back-to-back champions, two former winners, and two former finals participants are set for the Men’s EHF Cup Quarter-finals, which launch with the first-leg encounters this weekend. Defending back-to-back winners of the Men’s EHF Cup, Frisch Auf Göppingen, former EHF Cup winners Fraikin BM. 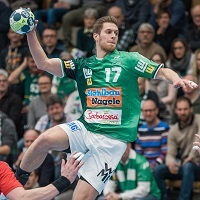 Granollers and Füchse Berlin, and former finalists Saint-Raphael Var Handball and Chambery Savoie Mont Blanc Handball are five of the six teams contesting the quarter-finals this year. The other, Croatian side RK Nexe, will make their debut in the quarter-finals when they open the first-leg clashes against Berlin on Saturday. With hosts SC Magdeburg already qualified for the EHF Cup Finals, there are only three quarter-final ties this season. RK Nexe are celebrating an anniversary this season, as it is their 10th successive season in the EHF Cup. The Croatian club have already celebrated the jubilee by making it further in the tournament than ever before. Until this season, reaching the EHF Cup Last 16 in 2011/12 and qualifying for the group phase in the 2014/15 season were their best results in European cup competitions. This season however, Nexe managed to clinch a quarter-final berth by being the third best second-ranked side in the group phase. Now, they are ready to take on Füchse, who won the competition in 2014/15, and reached the finals in 2013/14 and 2016/17. “We will only stand a chance against them if we are aggressive and play like warriors in the defence throughout the 60 minutes of the match,” said Nexe coach Hrvoje Horvat. Nexe already had the pleasure of facing German opposition in the group phase, where they suffered two three-goal defeats to group winners Frisch Auf Göppingen. “We over-respected Göppingen and did not use our chances, so we need to change that as well in these matches against Berlin,” said Horvat. Füchse will be entering the court in Nasice only 48 hours after losing away to THW Kiel, 20:25, in the Bundesliga. Berlin’s Swedish international Mattias Zachrisson sustained a knee injury towards the end and is in doubt for the upcoming clash. If you can win in Barcelona, there is probably no reason to fear any opponent or any venue. Win in Barcelona was exactly what Granollers did on April 4, as they caused FC Barcelona their first defeat in 147 home games when they won an Asobal League match in Palau Blaugrana, 29:28. On Saturday night, Granollers, who won the EHF Cup two year in succession in 1995 and 1996, are visiting another tough away venue: Saint-Raphael’s Palais des Sports JF Krakowski. After making it to the EHF Cup Finals last season and finishing fourth, Saint-Raphael were leading Group B until the second last match day in the 2017/18 group phase. That loss of no less than nine goals at home against Füchse Berlin (25:34) proves that the currently fourth-ranked side in the French league are not invulnerable at home. Granollers won Group D after taking three out of four points against another French team, Chambery, so the Spanish side should have the recipe for handling French opposition. Having won the Men’s EHF Cup for the past two years, Frisch Auf Göppingen are eager to defend the title once again – especially having made it as far as the quarter-finals and being just two matches away from the final weekend. Göppingen have at least one thing in common with the hosts for the first leg on Sunday evening: Both teams are currently number nine in their respective domestic leagues – Chambery in the Lidl Star Ligue and Göppingen in the Bundesliga. This also means that the EHF Cup is the chance for both teams to win a title this season. “To us, Chambery is a very attractive opponent. In recent years, they have always got far in the EHF Cup, and they are an experienced and well-playing team,” said Göppingen coach Rolf Brack.